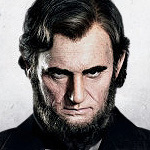 New Abraham Lincoln: Vampire Hunter Movie Trailer. Ben Walker, Mary Elizabeth Winstead and Dominic Cooper star in the horror thriller based on the novel by Seth Grahame-Smith. See the movie trailer and posters for Abraham Lincoln: Vampire Hunter below. From Tim Burton and Timur Bekmambetov, the director of Wanted and Night Watch. President Abraham Lincoln, widely lauded for preserving the Union and freeing the slaves, has a secret motivation behind his determined rise to power: to fight against the forces of the undead. MPAA Rating: (R) for violence throughout and brief sexuality. President Abraham Lincoln, widely lauded for preserving the Union and freeing the slaves, has a secret motivation behind his determined rise to power: to fight against the forces of the undead. From a young boy whose mother was killed at the hands of vampires, Lincoln makes it his life’s work to rid the nation of vampires, who nearly bring the nation to fracture during the Civil War.